Preheat oven to 350°F with a rack in the middle of the oven. Line the bottom of a 9-inch round tart pan with a removable bottom or an 8-inch square baking pan with parchment. Generously butter parchment and sides of pan. Combine flour, coconut, sugar and salt in a medium bowl. Stir in melted butter until evenly distributed in dry ingredients. Press mixture firmly in the bottom of the pan to form a solid, flat layer. Bake for 15 minutes, or until lightly golden. Remove and set aside to cool for a few minutes while you prepare the filling. Stir together coconut, sugar and egg whites. Evenly distribute blackberries across tart base. Using a small spoon or your fingertip, drop little tufts of macaroon filling around the blackberries, allowing them to stay at least partially uncovered. Bake for 20 to 25 until the peaks of the macaroon filling are golden. 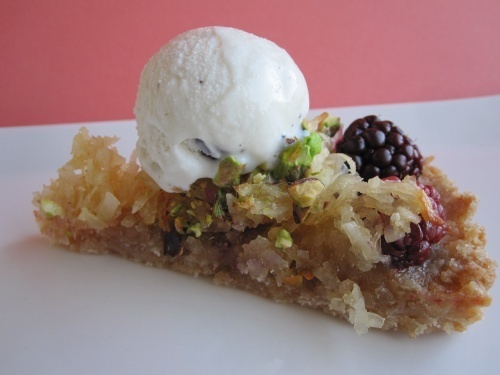 Let tart cool, then sprinkle with the crushed pistachios before slicing into skinny wedges or small squares. I recommend a scoop of ice cream, and enjoy! Next Next post: Here, honey!